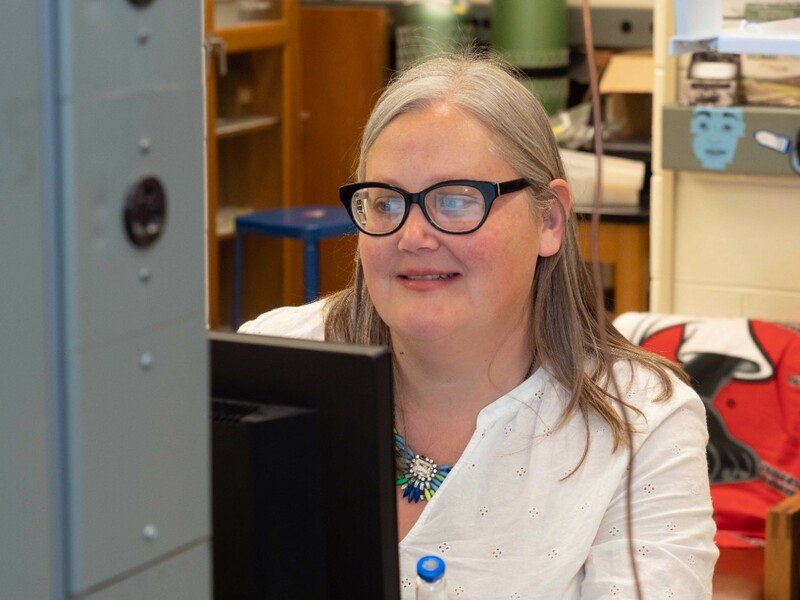 UC professor Amy Townsend-Small uses gas chromatography in her geology lab to study methane in drinking water in Eastern Ohio. A portable device can quickly detect the presence of methane in water. A time-series map, left, shows the Ohio counties where samples were collected for UC’s study. 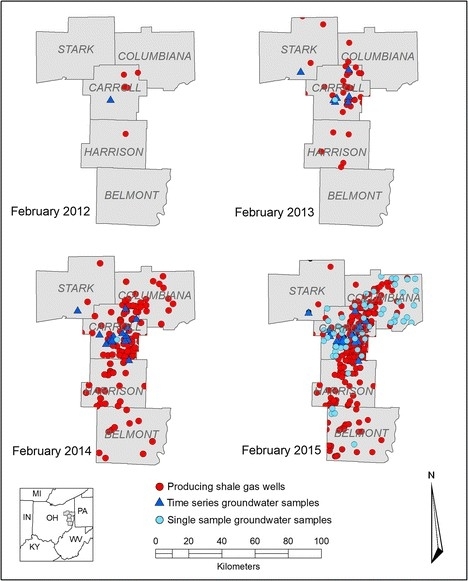 Red circles indicate active natural gas wells. Blue diamonds are sites where time series groundwater samples were taken. Light blue circles represent sites where a single sample of groundwater was collected. Groundwater sample locations are noted when samples were taken between the years noted in each map. There was a large increase in active natural gas wells from 2013 to 2014. 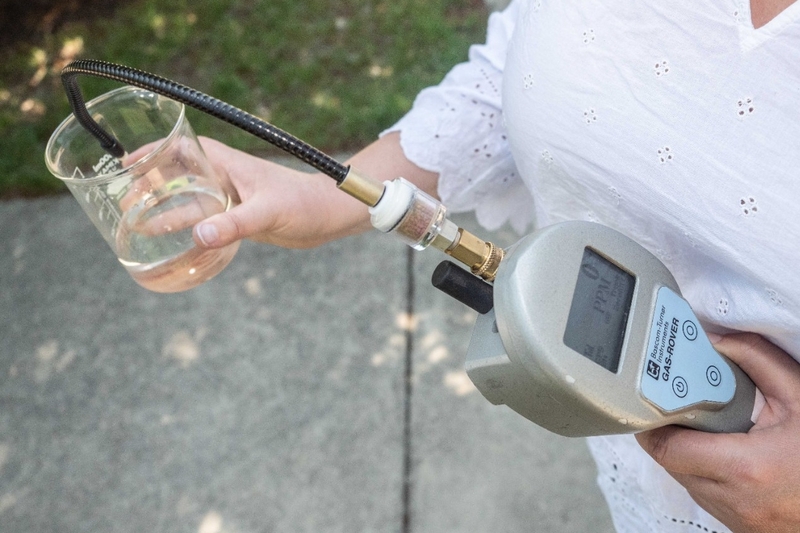 UC researchers collected 180 groundwater samples in total at homes in the three counties. Some of the sites were sampled multiple times. In particular, researchers looked for evidence of methane, the primary compound in natural gas. They also studied changes in the acidity or pH of the water, and changes to its conductivity. “Clearly, additional monitoring is needed to determine whether methane concentrations and source signals in this region change as the number of oil and gas wells continues to increase,” the study concluded. 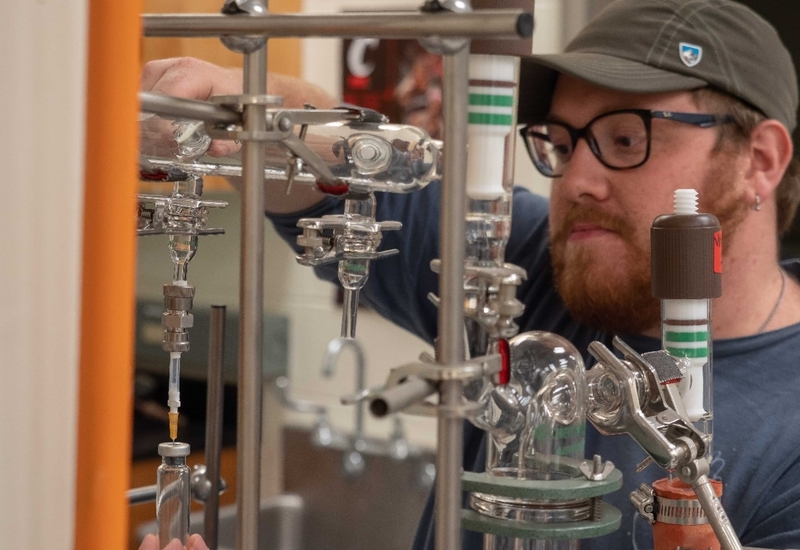 UC graduate student Jacob Deighton uses a vacuum line to prepare a sample in a geology lab. 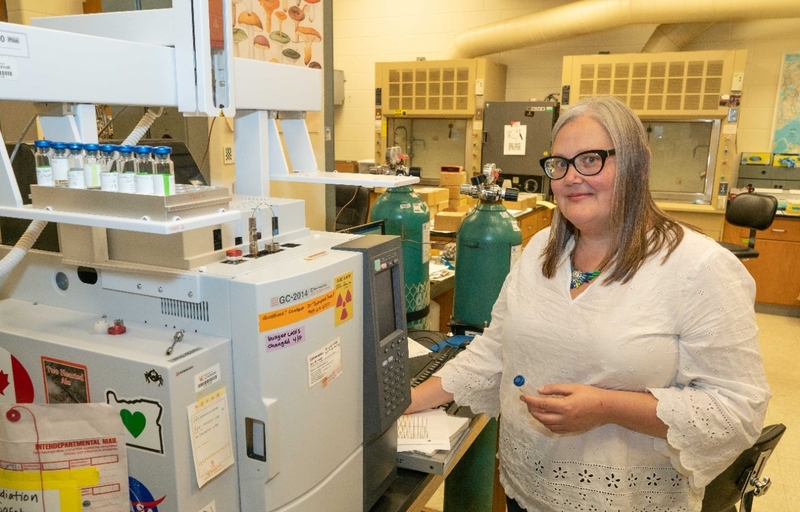 Researchers identified the chemical composition of the water using gas chromatography, isotope ratio mass spectrometry, and radiocarbon dating in a UC geology lab. Understanding the chemical composition helps identify the source of methane found in drinking water: from natural gas extraction, organic decomposition or even from the digestive systems of nearby cows. Lead author and UC graduate Claire Botner said the study solicited participation by homeowners who were willing to let researchers test their wells. The study area has seen increasing interest from natural gas companies in recent years. It’s located above a geological feature called the Utica Shale formation, which is known to harbor oil and natural gas. When UC launched its methane study in 2012, Ohio had issued 115 drilling permits for the region. By the study’s end in 2015, nearly 1,600 permits had been issued, primarily for Carroll County. Hydraulic fracturing is a process by which pressurized water, sand and chemicals are pumped into natural-gas wells more than a mile deep to break apart shale to release pockets of oil and natural gas. Researchers hypothesized that methane concentrations in the drinking-water wells they sampled would increase over time with the growth of natural gas drilling in the area. This is a correlation researchers observed in Pennsylvania’s Marcellus Shale region. But that’s not what UC’s water tests revealed. The study concluded that methane observed in groundwater was “biogenic,” or naturally occurring and independent of natural gas drilling. “The study researchers in Pennsylvania thought the contamination issue was a failure of the well casings in the fracking wells,” Townsend-Small said. Townsend-Small has spent much of her career researching groundwater and methane. 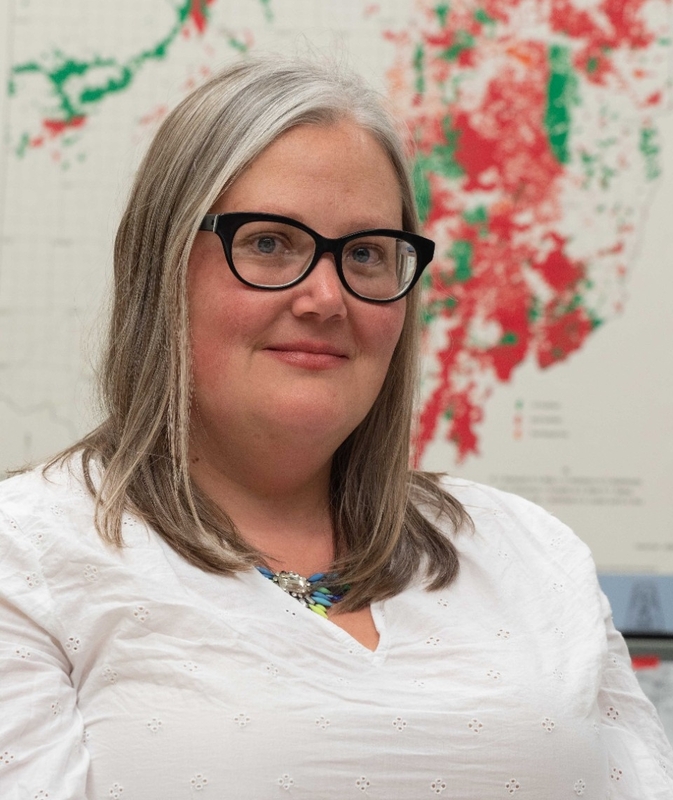 She and other UC geologists are studying the influence of the Great Miami River on groundwater in southwest Ohio at UC’s C.V. Theis Groundwater Observatory. She also has studied atmospheric methane in relation to algae blooms in the Great Lakes and methane in arctic lakes in Alaska. Study co-authors included UC professor emeritus David Nash and UC assistant professor of geology Joshua Miller. Botner said if researchers were to replicate the study, she might recommend expanding it to include other hydrocarbons such as propane or look for carbonate isotopes associated with natural gas drilling. UC geology professor Amy Townsend-Small has spent her career studying methane and groundwater. Carroll County Commissioner Robert Wirkner said the findings were good news for residents. Like many of his neighbors, he gets drinking water at his house from a private well on his property. Wirkner said gas companies test the drinking water of nearby homes before and after they drill a well to observe any changes in water quality. Townsend-Small said protecting wells from contamination is especially important in rural areas because there are few alternatives for clean drinking water. Digging a new or deeper well is expensive and would not necessarily solve a pollution problem. And there are few opportunities in rural areas to connect to public water lines. The study was funded in part with grants from the David F. & Sara K. Weston Fund and the Deer Creek Foundation. Instruments were provided with grants from the National Science Foundation. 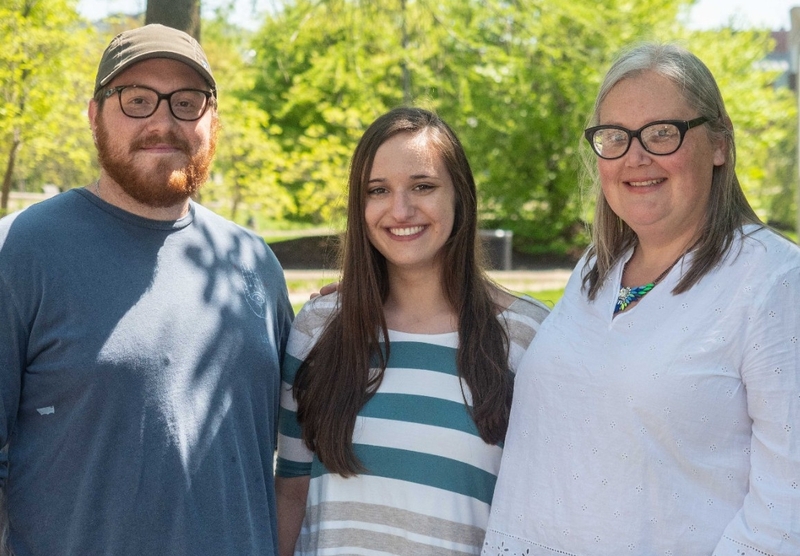 UC students Jacob Deighton and Laurie Heldman, left, pose with UC geology professor Amy Townsend-Small. Do you like field research? At UC, geology students get hands-on experience in their chosen subject area. Check out the Department of Geology or explore other programs on the undergraduate or graduate level.